University of Chicago students start playing improvised rock together in basements, name themselves after a small town in western Arizona (most of the way to California), and eventually release a CD of the results after some of its members have spread themselves around the globe. The music expands and contracts in slow grooves, with moments of haunting or vaguely morose (and sometimes harmonizing) vocals and melodicisms contrasted with blasts of noise, organ drones, or feedback-laden breakdowns. That dynamicism, as well as the effective job of self-editing done by the band, ensures that the album remains interesting through its 42-minute length and that none of the jams devolve into terminal self-indulgence, while still maintaining a frequent-enough improvisational edge. Credit, too, must be given to Jeff Boyd of Stroppy Analog for managing to engineer this large-sounding, large band (four guitars, bass, drums, and two more musicians playing organs & percussives) with plenty of loud outbursts as a clear, deep recording that fits into a sonic space suitable for home listening - sometimes things get as dense as Bardo Pond's first few albums, but there's barely any murk here. Even though the improvisational parts get a bit intense and dense at times, there aren't really any moments of breakout rock until the second half of album, which is not necessarily a bad thing. Sometimes it's a bit reminiscent of a thicker version of Spacemen 3's not-quite-rock drones, which only helps to accent when things do pick up a bit, as on "Chambers & Vessels". By the end of the album, you've had the opportunity to witness a fair amount of guitar-wreckage (or guitar-wreckage), pausing only for the deep drone-rock of "Easter Island". "Tarantula", at the conclusion, is a satisfying slice of Joy Division meets a bit of 'Saucerful' Floyd and Sonic Youth. Their press release says, "... Salomé doesn't play space rock or post rock ...", but you can't always believe everything you read in presskits. A second installment recorded at the same time, titled (curiously enough) 'P.M. ', is scheduled for release later in 2001. 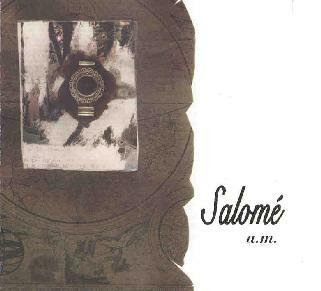 For more information you can visit Salomé at their web site. Contact via snail mail c/o Dutch Courage Records; 58 Herbert St; Brooklyn, NY 11222.